Latuff and Syria -- Cold War? Damascus, SANA – President Bashar al-Assad stressed that protecting civilians in Aleppo necessitates getting rid of the terrorists. Speaking in an interview with the Swiss SRF 1 TV channel, the President said "Of course, it's our mission according to the constitution and the law. We have to protect the people, and we have to get rid of those terrorists in Aleppo. That's how we can protect civilians." He added that it goes without saying that the way to protect the civilians in Aleppo is to attack the terrorists who hold the civilians under their control and are killing them. Journalist: Mr. President, thank you very much for having welcomed Swiss Television and our program Rundschau here in Damascus. President Assad: You are most welcome in Syria. Question 1: First, please, allow me to clarify one thing: may I ask you every question? President Assad: Every question, without exception. Question 2: I'm asking because one of your conditions is that interview is being broadcast in its full version. Are you afraid that we might manipulate your statements? President Assad: You should answer that question, but I think we should build this relation upon the trust, and I think you are worried about the trust of your audience, so I don't think so. I think you have good reputation in conveying the truth in every subject you try to cover. Question 3: Do you see it as a lie, that the world considers you as to be a war criminal? President Assad: That depends on what the reference in defining that word. Is it the international law, or is it the Western agenda or the Western political mood, let's say, that's being defined by vested-interests politicians in the West? According to the international law, as a President and as government and as Syrian Army, we are defending our country against the terrorists that have been invading Syria as proxies to other countries. So, if you want to go back to that word, the "war criminal," I think the first one who should be tried under that title are the Western officials; starting with George Bush who invaded Iraq without any mandate from the Security Council. Second, Cameron and Sarkozy who invaded and destroyed Libya without mandate from the Security Council. Third, the Western officials who are supporting the terrorists during the last five years in Syria, either by providing them with political umbrella, or supporting them directly with armaments, or implementing embargo on the Syrian people that has led to the killing of thousands of Syrian civilians. Secretary of State John Kerry called you "Adolf Hitler" and "Saddam Hussein" in the same breath. Does it bother you? President Assad: No, because they don't have credibility. This is first of all. Second, for me as President, what I care about first and foremost is how the Syrian people look at me; second, my friends around the world – not my personal friends as President, I mean our friends as Syrians, like Russia, like Iran, like China, like the rest of the world – not the West, the West always tried to personalize things, just to cover the real goals which is about deposing government and getting rid of a certain president just to bring puppets to suit their agenda. So, going back to the beginning, no I don't care about what Kerry said, at all. It has no influence on me. Question 5: You're the President of a country whose citizens are fleeing, half of your fellow citizens. The people are not only fleeing because of the terrorists, of ISIS, or the rebels, but also because of you. President Assad: What do you mean by me? I'm not asking people to leave Syria, I'm not attacking people; I'm defending the people. Actually, the people are leaving Syria for two reasons: first reason is the action of the terrorists, direct action in killing the people. The second one is the action of the terrorists in order to paralyze the life in Syria; attacking schools, destroying infrastructure in every sector. Third, the embargo of the West that pressed many Syrians to find their livelihood outside Syria. These are the main reasons. If you can see that the second factor and the third factor are related, I mean the role of the terrorists and the West in undermining and hurting the livelihoods of the Syrians, is one and, let's say, is commonality between the terrorists and Europe. Question 6: When you speak of terrorists, who do you mean by that? Surely ISIS, but also the "Free Syrian Army" or the Kurds? President Assad: What I mean is like what you mean as a Swiss citizen, if you have anyone who carries machineguns or armaments and killing people under any titles, and committed vandalism, destroying public or private properties; this is a terrorist. Anyone who adopts a political way in order to make any change he wants, this is not a terrorist. You can call him opposition. But you cannot call somebody who is killing people or holding armaments, you cannot call him opposition, in your country, in my country as well. Question 7: Well, you don't have any free opposition in your country. President Assad: Of course we have, of course we have. We have real opposition, we have people who live in Syria, whom their grassroots are the Syrian people, they're not opposition who were forged in other countries like France or UK or Saudi Arabia or Turkey. We have them, and you can go and meet them and deal with them with your camera. You can do that yourself. Aleppo? I'm sure that you are discussing about it at the family table. President Assad: Yeah, of course if I'm going to explain to them, I'm going to explain about what is happening in Syria, not only in Aleppo, taking into consideration that my children are full-grown now, they understand what is going on Syria. But if you want to explain to them or to any other child what is happening, I'm going to explain about the role of the terrorists, about the role of Qatar, Turkey, Saudi Arabia in supporting those terrorists with money, with logistic support, and the role of the West in supporting those terrorists either through armament or through helping them with the propaganda and the publicity. I'm going to explain to them in full what's going on. Question 9: Do you, as a father, also say that you have nothing to do with the bombardments of the hospitals in Aleppo? President Assad: Look, when they say that we are bombarding the hospitals, it means that we are killing civilians. That is the meaning of the word. The question is why would the government kill civilians, whether in hospitals or in streets or schools or anywhere? You are talking about killing Syrians. When we kill Syrians, as a government, or as army, the biggest part of the Syrian society will be against us. You cannot succeed in your war if you are killing civilians. So, this story, and this narrative, is a mendacious narrative, to be frank with you. Of course, unfortunately, every war is a bad war, in every war you have innocent victims, whether children, women, elderly, any other civilian, any other innocent who is not part of this war, he could pay the price, this is unfortunately. That's why we have to fight terrorism. When we don't say that, it's like saying – according to that question or that narrative, that you may reflect in your question – that the terrorists, Al Qaeda, al-Nusra, ISIS, are protecting the civilians, and we as government are killing the civilians. Who can believe that story? No one. Question 10: But who else got airplanes or bunker-busting bombs besides your army? President Assad: It's like you're saying that everyone who is killed in Syria was killed by the airplanes or aircrafts, military aircrafts! The majority of the people were killed by mortars shelled by the terrorists on them while they're at schools, in their hospitals, in the streets, anywhere. It's not related to the aerial bombardment. Sometimes you have aerial bombardment against the terrorists, but that doesn't mean that every bomb that fell somewhere was by airplane or by the Syrian Army. If you are talking about a specific incident, let's say, we have to verify that specific incident, but I'm answering you in general now. Question 11: But you have the power to change the situation also for the children in Aleppo. Journalist: Will you do that? President Assad: Exactly, that's our mission, according to the constitution, according to the law; that we have to protect the people, that we have to get rid of those terrorists from Aleppo. This is where we can protect the civilians. How can you protect them while they are under the control of the terrorists? They've been killed by them, and they've been controlled fully by the terrorists. Is it our role to sit aside and watch? Is that how we can protect the Syrian people? We need to attack the terrorists, that's self-evident. Question 12: May I show you a picture? Journalist: This young boy has become the symbol of the war. I think that you know this picture. President Assad: Of course I saw it. Journalist: His name is Omran. Five years old. Journalist: Covered with blood, scared, traumatized. Is there anything you would like to say to Omran and his family? 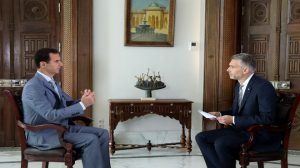 President Assad: There's something I would like to say to you first of all, because I want you to go back after my interview, and go to the internet to see the same picture of the same child, with his sister, both were rescued by what they call them in the West "White Helmets" which is a facelift of al-Nusra in Aleppo. They were rescued twice, each one in a different incident, and just as part of the publicity of those White Helmets. None of these incidents were true. You can have it manipulated, and it is manipulated. I'm going to send you those two pictures, and they are on the internet, just to see that this is a forged picture, not a real one. We have real pictures of children being harmed, but this one in specific is a forged one. Question 13: But it's true that innocent civilians are dying, in Aleppo. Aleppo that time, and we haven't heard a single statement by Western officials regarding the children of Aleppo. Now, they are talking about Aleppo recently just because the terrorists are in a bad shape. This is the only reason, because the Syrian Army are making advancement, and the Western countries – mainly the United States and its allies like UK and France – feeling that they are losing the last cards of terrorism in Syria, and the main bastion of that terrorism today is Aleppo. Question 14: Everything is allowed in this war for you. President Assad: No, of course, you have the international law, you have the human rights charter, you have to obey. But in every war, every war in the world during the history, you cannot make sure a hundred percent that you can control everything in that direction. You always have flaws, that's why I said every war is a bad war. But there's difference between individual mistakes and the policy of the government. The policy of the government, to say that we are attacking civilians, we are attacking hospitals, we are attacking schools, we are doing all these atrocities, that's not possible, because you cannot work or go against your interests. You cannot go against your duty toward the people, otherwise you are going to lose the war as a government. You cannot withstand such a ferocious war for five years and a half while you are killing your own people. That's impossible. But you always have mistakes, whether it's about crossfire, it's about individual mistakes… bring me a war, a single war in the recent history, that it was a clean war. You don't have. Question 15: Do you have made any mistakes too in this war? President Assad: As President I define the policy of the country, according to our policy, the main pillars of this policy during the crisis is to fight terrorism, which I think is correct and we will not going to change it, of course, to make dialogue between the Syrians, and I think which is correct, the third one which is proven to be effective during the last two years is the reconciliations; local reconciliations with the militants who have been holding machineguns against the people and against the government and against the army, and this one has, again, proven that it's a good step. So, these are the pillars of this policy. You cannot talk about mistakes in this policy. You can talk about mistakes in the implementation of the policy, that could be related to the individuals. Question 16: You still believe in a diplomatic solution? President Assad: Definitely, but you don't have something called diplomatic solution or military solution; you have solution, but every conflict has many aspects, one of them is the security, like our situation, and the other one is in the political aspect of this solution. For example, if you ask me about how can you deal with Al Qaeda, with al-Nusra, with ISIS? Is it possible to make negotiations with them? They won't make, they're not ready to, they wouldn't. They have their own ideology, repugnant ideology, so you cannot make political solution with this party; you have to fight them, you have to get rid of them. While if you talk about dialogue, you can make dialogue with two entities; the first one, political entities, any political entities, whether with or against or in the middle, and with every militant who is ready to give in his armament for the sake of the security or stability in Syria. Of course we believe in it. Question 17: There are news from Russia about a short humanitarian pause in Aleppo on Thursday, what does it mean this humanitarian pause, can you explain? President Assad: It's a short halting of operations in order to allow the humanitarian supply to get into different areas in Aleppo, and at the same time to allow the civilians who wanted to leave the terrorist-held areas to move to the government-controlled area. Question 18: This is really a step, an important step? President Assad: Of course, it is an important step as a beginning, but it's not enough. It's about the continuation; how can you allow those civilians to leave. The majority of them wanted to leave the area held by the terrorists, but they won't allow them. They either shoot them or they kill their families if they leave that area. Question 19: Russia is on your side, what does it mean for you? President Assad: No, it's not on my side. It's on the international law's side. It's on the other side which is opposite to the terrorists' side. This is the position of Russia, because they wanted to make sure that the international law prevails, not the Western agenda in toppling every government that doesn't fit with their agendas. They wanted to make sure that the terrorism doesn't prevail in that area, that would affect negatively the Russians themselves, Russia itself as a country, and Europe and the rest of the world. 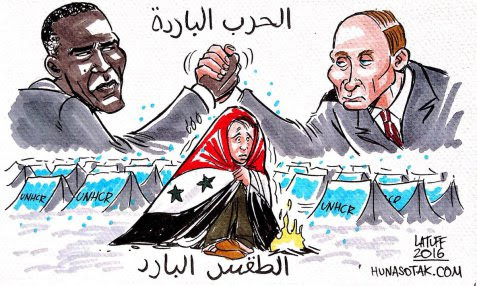 That's what it means for Russia to stand beside the legitimate Syrian government and the Syrian people. Question 20: Mr. President, you use chemical weapons and barrel bombs in Syria against your own population, these are UN reports, you can't ignore it. President Assad: You are talking about two different issues. The chemical issue, it was proven to be false, and they haven't a shred of evidence about the Syrian Army using chemical weapons, particularly before we give up our arsenal in 2013, now we don't have it anyway. Before that, it was fiction because if you want to use such mass destruction armaments, you're going to kill thousands of people in one incident, and we didn't have such incidents. Beside that, we wouldn't use it because you're going to kill your own people, and that's against your interest. So, this is a false allegation. We don't have to waste our time with it. You live in Syria, there is a traditional war, but there is nothing related to mass destruction armaments. Journalist: But the UN report is not a fiction. Aleppo, when we said that the terrorists used chemical weapons against our army, and we invited the United Nations to send a delegation. We, we did, and at that time, the United States opposed that delegation because they already knew that this investigation – of course if it's impartial – is going to prove that those terrorists, their proxies, used chemical armaments against the Syrian Army. Regarding the barrel bombs, I want to ask you: what is the definition of barrel bomb? If you go to our army, you don't have in our records something called "barrel bomb," so how do you understand – just to know how I can answer you – what a barrel bomb is? We have bombs. Journalist: The destruction… it's the destruction, and it is against humanitarian law. President Assad: Every bomb can make destruction, every bomb, so you don't have bomb to make nothing. So, this is a word that has been used in West as part of the Western narrative in order to show that there is an indiscriminate bomb that has been killing civilians indiscriminately and that opposes the Western narrative, I'll show you the contradiction: in other areas they say that we are bombarding intentionally the hospitals, and you mentioned that, and they are targeting intentionally the schools, and we targeted intentionally the convoys to Aleppo last month, those targets need high-precision missiles. So, they have to choose which part of the narrative; we either have indiscriminate bombs or we have high-precision bombs. They keep contradicting in the same narrative, this is the Western reality now. So, which one to choose? I can answer you, but again, we don't have any indiscriminate bombs. If we kill people indiscriminately, it means we are losing the war because people will be against us; I cannot kill the Syrian people, either morally or for my interest, because in that case I'm going to push the Syrian community and society towards the terrorists, not vice versa. Question 21: I would like to mention the subject of torture prisons, Mr. President. Amnesty speaks of seventeen thousands dead. Regarding the prison of Saidnaya, there are still horrible reports. When will you allow an independent observer into that prison? President Assad: Independent, and Amnesty International is not independent and it is not impartial. President Assad: We didn't discuss it with the Red Cross, we didn't discuss it. It should be discussed in our institutions, if you want to allow… if there is allegation, it could be discussed. We don't say yes or no, but the report you have mentioned, it was a report made by Qatar, and financed by Qatar. You don't know the source, you don't know the names of those victims, nothing verified about that report. It was paid by Qatar directly in order to vilify and smear the Syrian government and the Syrian Army. Journalist: But there are a lot of eyewitnesses. President Assad: No one knows who are they. You don't have anything clear about that. It's not verified. So, no. Journalist: Then open the door for organizations like Red Cross. President Assad: It's not my decision to tell you yes or no. We have institutions, if we need to discuss this part, we need to go back to the institutions before saying yes or no. Question 22: Why are you sure that you are going to win this war? President Assad: Because you have to defend your country, and you have to believe that you can win the war to defend your country. If you don't have that belief, you will lose. You know, part of the war is what you believe in, so, it's self-evident and very intuitive that you have to have that belief. Question 23: If you walk through Damascus, your picture is everywhere, in every shop, in every restaurant, in every car, a symbol for a dictator, is this your way to fix your power? President Assad: There is a difference between dictator and dictatorship. Dictator is about the person. I didn't ask anyone to put my picture in Syria, I never did it. This is first. Second, to describe someone as a dictator, you should ask his people, I mean only his people can say that he is a dictator or he is a good guy. Journalist: Thank you Mr. President for having answered our questions for Swiss Television and the Rundschau. President Assad: Thank you for coming to Syria.